Rajasthan – the land of royalty – a glittering jewel set in the golden sands of the barren Thar Desert, with a wealth of rich culture, tradition and heritage. 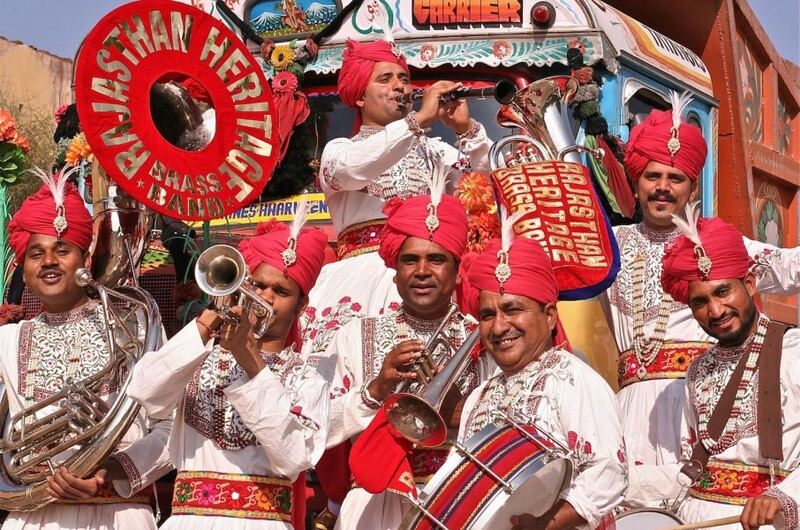 The Rajasthan Heritage Brass Band is a living embodiment of this landscape, a spectacular celebration of its vibrant and colourful lifestyle, their music and dance a heady, exciting and hypnotic reflection of this enchanting region. Extensive touring since 2015 has established them as the premier touring Rajasthani brass band for literally all events, from festivals and melas to parties and weddings. With a diverse repertoire spanning Rajasthani folk songs, Bollywood hits, spiritual qawwali, Bhangra beats. sci-fi and intergalactic funk and even some well loved pop songs, these vividly costumed artists cover the full spectrum of the evocative and joyous music that governs life in Rajasthan. Highly talented musicians from Jaipur, Rajasthan’s renowned “Pink City”, the surrounding villages, make up the brass core of this rousing new ensemble on trumpet, trombone, euphonium and sousaphone, supplemented with clarinet, against an insistent background of percussion on side, bass and dhol drums.